Given the sheer number of K-pop concerts and events being announced every month, iKon's US debut has been long overdue, but the hard-hitting group (which has been producing bops and deep dives since 2015) made a big, well-deserved splash at South by Southwest before landing in NYC at Samsung 837 to give East Coast iKonics a major treat. —The ~ikonic~ septet was greeted with deafening screams (I can attest to this...and also contributed to this), and the screams kept going through the entire event. —They participated in a casual Q&A with popular gamer Ninja. —They played a few rounds of Fortnite (a ~scenario~ I can bet you most K-pop fans *can't* say they've witnessed live). —They performed a few old and new hits: "Rhythm TA," "Love Scenario," "Bling Bling," and solo songs by Bobby ("Holup!" and "Up") and B.I ("Be I" and "One and Only") — Bobby splashed some of the audience with his water bottle and almost slipped, but kept hyping on! Ahead of their hyped appearance, we sat down with the group and asked them questions about performing stateside, and their favorite songs, fans, and journeys since their debut. How did you feel performing at SXSW, especially as your US debut? Was it what you expected? B.I: "First of all, it was an honor to be onstage. We were received so well, much more than we expected, so we were really thankful for that and it made us want to perform more here in the States." 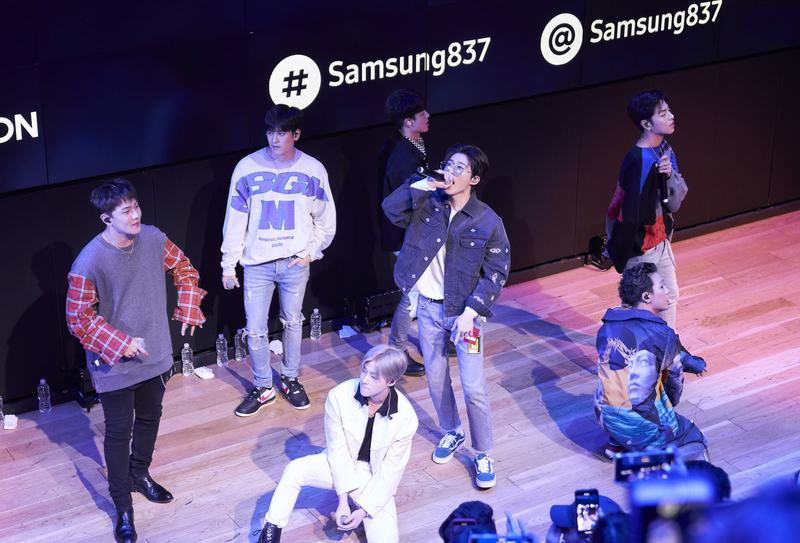 According to Billboard, iKon was mentioned 79,000 times in connection with SXSW and there were multiple hashtags circulating, making iKon one of the most talked-about acts of the entire festival, including non-music guests (the boys were surprised to hear this, BTW). Do you ever check fans' tweets and comments on social media? B.I: "Yes, we constantly check and monitor our fans and what they have to say about our performances, and it's been really helpful to understand the interaction between our fans and our performances." Which iKon song represents you the best, and why? B.I: "Two songs come to mind: 'Love Scenario' and 'Bling Bling.' For 'Love Scenario,' there are a lot of vocals in that song and it's a great song to perform what we do best, which is hip-hop and vocal performance. And personally, I think 'Bling Bling' is probably one of our strongest, most powerful songs." Bobby: "B-Day. Whenever we perform it onstage, it gives us the biggest energy." Which song do you like performing the most? B.I: "We love to perform songs that are fun and powerful, like 'Bling Bling' and 'B-Day.' It makes the audience really happy and I think it makes them really engaged with us." After all these years in the music/K-pop industry, how do you stay inspired? B.I: "The fans and the support and love they give us." What about in terms of songwriting? B.I: "[For my songwriting], I get inspired by dramas and movies. I'm very creative so I think a lot and imagine a lot." If you didn't already know, B.I is responsible for writing almost every iKon song and Bobby cowrites more times than not, so HATS OFF to them — because one thing that's always impressed me about iKon is their range: their trajectory from the happyish "Love Scenario" to the darker "Killing Me" in 2018 to the low-key but somber "I'm OK" most recently proves that they're always coming up with fresh sounds, and making sure fans are definitely *not* OK with each comeback (but in the best way possible). If any of the other members wrote their own song, what would it be like? Chan: "I don’t really write songs, because we have really great songwriters in our group, but [hypothetically] if I were to write a song, it would be very fun and catchy." Chan, since fans give you props to use on your YouTube channel, what’s been the most memorable prop so far, and what kind of videos do you want to make in the future? Chan: "My fans often give me props to use on my channel, like games or snacks. I think what was most memorable so far was a toy that I received and gave to Bobby — probably because that was the first thing a fan had given me as something to use on my channel. Obviously I love games, and I think I will probably feature more content related to games, and if I have the opportunity in the future to work with Fortnite in creating some content, that would also be great." What makes you excited for iKON’s future? Jay: "We're here in America to perform and we're very excited about that. This trip keeps us dreaming about the future, about coming here to America to perform here — whether it's concerts or performances, we'd love to come here often." Bobby: "Family's first. We're all working for our families, but we don't have much time to see them. They come out for shows, but not often." If you want to feel all of the family feels, you might want to check out Bobby's tear-jerking hypnosis session. For Song, it's being able to connect with fans all across the world, despite language barriers. Song: "We tour internationally, and even though we have different languages, we're able to communicate through our songs, and that's something really meaningful to us." FYI, you can get the iKonik outfit and Scenario emote (inspired by Chan) now within Fortnite, exclusively for players using the Samsung Galaxy S10, S10+, and S10e!